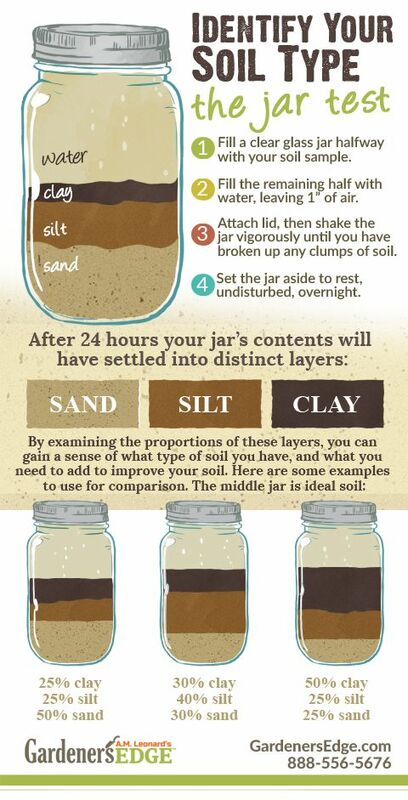 Have you ever noticed how soil tests just don’t seem to tell you what you really want to know about your soil? That’s come to our attention, too. That is the exact reason why it’s time for a change. We have enough experience under our belt in the soil lab to know that there are serious issues with soil testing and the analysis of those soil tests. It is time to expand our lab services to better address these problems, but we just don’t have the equipment needed, nor the space. No worries though…. we have something even better! Midwest Labs is now offering a customized soil testing package just for our growers and consultants. This package combines Midwest Labs’ most widely used Base Saturation extraction with Dr. Rick Haney’s H3A extraction. What’s the purpose of two tests you ask? These two tests together will address the high UNAVAILABLE calcium numbers, give an accurate phosphate extraction, and allow us the ability to assess your crop quality and weed pressure. That is a home run in our opinion! We have been talking about carbon in the soil for quite some time now and it only makes sense to come up with a good way to measure it. As an addition to the base package we are also offering a water extractable carbon and nitrogen test. The combination of this with the organic matter percentage will not only tell us the potential carbon in the soil but also the quality of that carbon. A large percentage of organic matter in the soil is just not enough. You need quality organic matter for biological activity. We also have a new format to our test report. This format will quickly address the problems at a glance. The issues will be highlighted in red along with a note describing the issue. There will be a bar graph showing desired mineral balance as well as a graph for your observed mineral balance. This will help the grower/consultant quickly see where the imbalances are. We are most excited about the new addition of observed phosphorus to potassium ratio. This is important to note because herbicide resistance has been seen in soils with a P:K ratio of 0.125:1, or 8 times more potassium than phosphorus. Has this sunk in yet? A soil test that can actually predict POTENTIAL weed issues! Our new submittal form can be found to the right. This form will include our account number and services available through Midwest Labs as well as their address to send samples. There is space included for a micronutrient add-on package and any other testing you would like. All billing will go through us. All we ask is you please help us by providing the proper information when submitting your samples. We need to know where to send the report and who to bill for the testing. To prepare a soil sample collect soil from the aerobic zone (typically the top 2-3 inches) and fill a sample bag to the fill line (approximately two cups). If you do not have a soil sample bag you may use a breathable container like a paper lunch sack. Make sure you label the sample with as much information as possible so you can match your results to the correct location. Click on the yellow circle on the far right of the header to open or close each section. We often soil test to make accurate fertilizer recommendations. Most soil tests, however, do not report on the elements that make up the majority of a crop. If the majority of a plant is carbon, oxygen, and hydrogen then the soil test reports should be interperated with these elements in mind. Accurate interpretation of soil test reports is one of the most important components in high quality production. Misinterpretation of a soil test can lead to soil mineral imbalances and improper fertilizer recommendations. The first step in interpreting soil test reports is determining the carbon, oxygen, and hydrogen content of the soil. If these elements are limited in the soil, the success of N-P-K fertilizers will also be limited. As your carbon level decreases your nitrogen inputs increase. If you can increase the carbon and oxygen levels in your soil, you can decrease your input costs and increase your fertilizer use efficiency. As CARBON decreases NITROGEN needs increase. Improper soil test interpretation can cost you money. Determine your carbon and oxygen levels before calculating your fertilizer needs. Water Soluble. A water soluble soil test is an extraction of the minerals from the soil using distilled or deionized water. This test can also be called a Saturated Paste test. Weak Acid. This extraction of minerals from the soil is done with a mild acid solution that is close to the pH of a plant’s root exudates. Results are considered to be plant available nutrients. If you like analogies you can think of this as your “checking account”. Strong Acid. Strong acid soil tests use a very acidic solution to remove minerals from the soil. This type of testing will give you your cation exchange capacity (CEC) and percent base saturation. This strong acid is more of a mineral analysis. We like to say it’s the “mining report” or “savings account” of your soil. Most soil testing labs will use a strong acid to report the CEC and Base Saturation tests. Sample in the AEROBIC ZONE of the soil. Soil testing is just ONE tool in the toolbox. Based on years of experience, we found that the old models for interpreting soil test reports were not accurately describing quality production. They missed the majority of plant. By looking at soil mineral ratios instead of specific numbers, we can achieve more accurate recommendations. Balancing the soil mineral ratios improves the soil’s structure which increases the natural carbon, oxygen, hydrogen, and nitrogen levels in the soil. Soil mineral availability is dependent upon the interactions between and among minerals. Mineral availability begins with calcium. Next, the soil should have twice as much phosphorus as potassium. 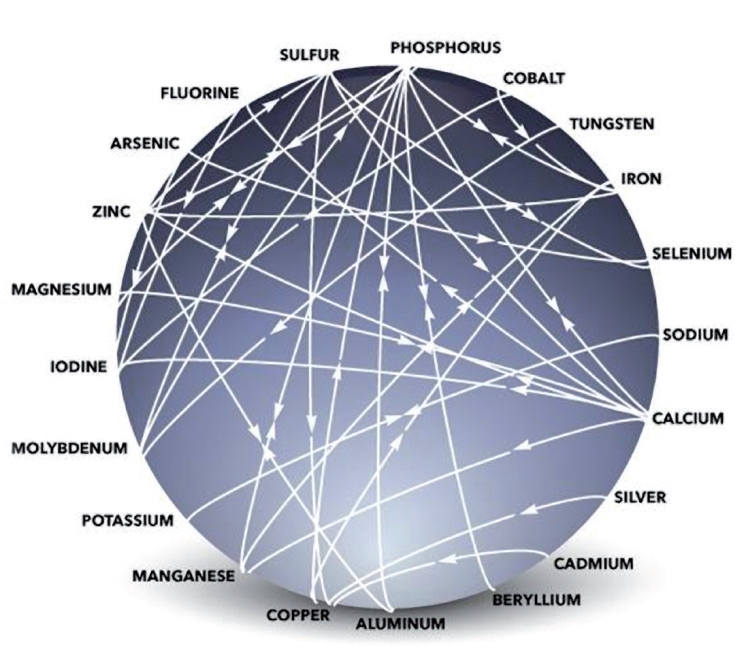 If we look at the mineral interaction chart we can see phosphorus’s role in mineral availability. 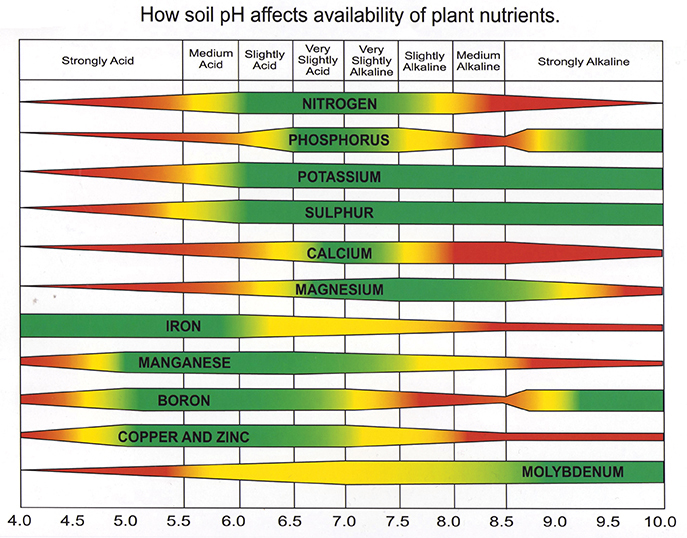 Many of the micronutrients necessary for quality plant growth require phosphorus. Using the ratios listed below as your guide, you can interpret any type of soil test gaining insight into the availability of the soil minerals within the sample. Arrows pointing together mean that minerals interact: both are required for either to be available. Arrows pointing toward the other one means that the second mineral requires the first one. Oxygen needs to be attached to minerals for plant availability. Sustainable balancing of the soil’s pH is only achieved through balancing the soil minerals and increasing the biological activity of the soil.